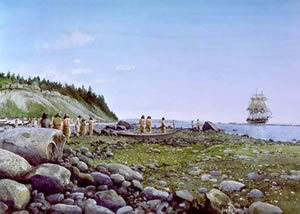 First recorded contact by the Europeans with First Nations people in this region occurred at the ancient village of Tsa-Kwa-Luten, “the gathering place” on Quadra Island, by Captain George Vancouver in 1792. His orders included a survey of every inlet and outlet on the west coast of the mainland, all the way north to Alaska. 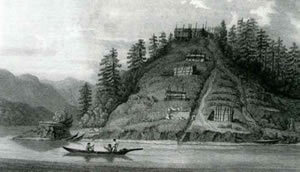 At that time Tsa-Kwa-Luten was inhabited by the Coast Salish peoples. After the British explorers arrived, approximately in 1841, the Salish abandoned Tsa-Kwa-Luten and the surrounding villages and headed south. The Laichwiltach peoples moved in and took advantage of the rich salmon fishing grounds and the strategic trading position offered by the narrow Discovery Passage. About that time the Laichwiltach peoples were made up of the We-Wai-Kai of Cape Mudge, Wei-Wai-Kum of Campbell River, Walatsama of Salmon River and Kwiakah of Philips Arm. 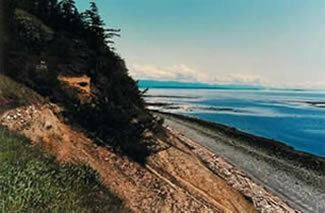 Villages were established in Campbell River and at Cape Mudge on Quadra Island, making this area the southernmost territory of the Kwak’wala speaking peoples. The Laichwiltach (Laichkwiltach / Lekwiltok / Ligwithdaxw) peoples are part of the Nation now commonly referred to as the Kwakwak’awakw (and Kwak’wala speaking people). The Kwakwak’awakw Nation’s territory extends from Cape Mudge to the mouth of Bute Inlet in the south to Smith Inlet in the north and around the northern part of Vancouver Island to Quatsino Sound on the west coast of Vancouver Island. The Laichwiltach are the southernmost of the Kwak’wala speaking people. Find out more about Local West Coast Native History. Family Owned & Operated - Locally Born Guides with 40 + Years Experience! We went to see Grizzly Bears and that’s what we got ! At one stage there ten bears in view including mother and triplets right up close. And we saw another mother and cub at a further location. This is a small friendly and personal company; flexible when they can be and went out of their way to include sea-life on the trip. Be aware that you need to cross back to the mainland to see the bears and that is 2-3 hrs by boat depending on what happy distractions of sea lions, seals, birds etc that you come across. The tour includes a basic but enjoyable lunch of sandwiches, drinks and fruit. Highly recommended !